This summer, the town is your oyster: three places to slurp with abandon. If you love the pearl of bivalves but find you’re having to choose between indulging in oysters or paying your bills, check out the following establishments; only you can decide if they’re easing your budget woes…or enabling your habit. Craving oysters after catching waves? Head for the Happy Hour at beach-adjacent Enterprise Fish Company. 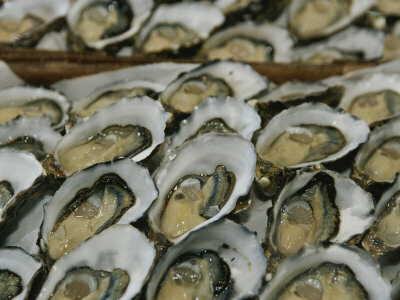 Oysters on the half shell are $1 a piece from 4:00PM – 7:00PM Monday through Saturday and 8:00PM – 10:00PM on Sunday. An oyster shooter is $1.50 while the $3 Absolut Vodka/oyster shooters let you booze it up with your choice of available bivalves. Longing for lobster? On Mondays and Tuesdays, Enterprise Fish Company gives your pocketbook a break with their special: a two lb. lobster and two sides for $39.95. Thanks to Church and State‘s “Oyster Tuesdays“, the pre-Humpday work week has become a little less painful for Downtown’s oyster-loving oenophiles. Seafood specialist Christophe Hapillon has a special love for what he considers the “fruit of the sea” and he likes to table hop to discuss the finer points of his picks. Church and State sommelier Jeremiah Henderson pairs wines with Happillon’s North American favorites, which include Carlsbad Luna, Totten Virginica, Malpeque, and British Columbia Fanny Bay oysters. At $38 for a dozen and $19 for a half-dozen, these aren’t bargain mollusks but the chance to chat with a master chef about his passion? Priceless. Previous Post The Lieutenant of Inishmore: Wee Thomas and twelve gallons of blood. Next Post Downtown breakfast…with goats.